So we are going to create a new application launcher for our proxy auto-detecting version of Chromium. Enter these four commands below into your terminal to start editing your new Chromium application launcher. line 3: Name=Chromium Web Browser – Auto Proxy – I only changed the English version here; if you are a linguist you could change the other translations too! Find all lines beginning Exec and add –proxy-auto-detect to the end of the command line. My complete updated file is shown below. Save and close the file. 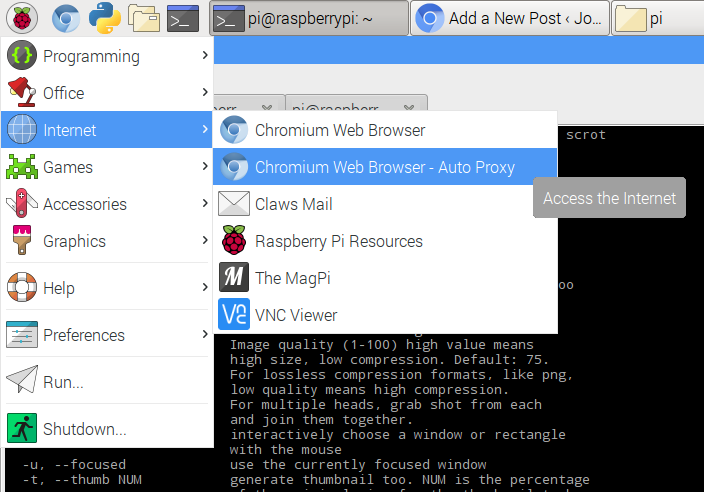 You should now have a new entry in your menu for your proxy version of Chromium! You can then add this new application launcher to your panels or desktop. As we added it to the raspi-ui-overrides as a new application any updates to the original Chromium application launcher should affect this modified one!